Deep Forest Chrome Oxide Green. Opaque and strong tinting strength. Suitable for all media, including fresco. Q: Can you tell me the color index number(s) for this pigment? 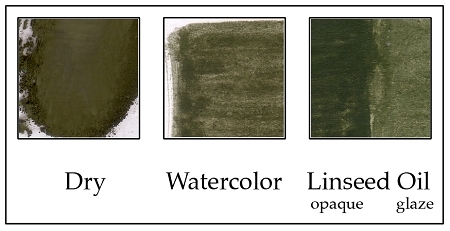 A: This pigment is a blend of Chrome Oxide Green PG17 and Iron Oxide Black PBK11 and does not have its own CI classification.